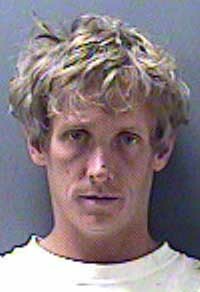 Kent J. Muer, 34, was charged with the felony crime of attempted strangulation on Monday, the same day he was arraigned on a misdemeanor DUI charge and had his bond increased in an earlier criminal case pending against him in Blaine County 5th District Court. Muer now has three separate criminal cases against him in Blaine County. He is also being investigated by the Blaine County Sheriff's Office in connection with two burglaries reported in the Gimlet area on Aug. 5. In the attempted strangulation case, the Sheriff's Office alleges that Muer choked his girlfriend at the couple's home in the Aspen Hollow area of Gimlet on the evening of Thursday, Aug. 4. Deputy Joshua Pritchard wrote in a probable-cause affidavit that the woman told him that Muer became upset because she "over-cooked the pork chops." Pritchard further reported that the woman said Muer "had kicked or struck her with a closed fist," put his hands around her throat and "attempted to strangle her" and pushed her head against the corner of a countertop. Pritchard wrote that the woman had bruises and cuts that were consistent with her story. He wrote that the woman fled the home and hid in a horse barn until Muer left the residence "on a riding lawn mower." Muer was arrested the following day on a misdemeanor DUI charge for allegedly driving the John Deere Gator in an intoxicated state on Gimlet Road. He was also charged in January with misdemeanor DUI and felony possession of marijuana following a traffic stop in Hailey. One of the pending misdemeanor DUI charges against Muer could be amended to a felony since Muer also had a misdemeanor DUI conviction in Blaine County in 2007. Idaho law provides that a person with two misdemeanor DUI convictions within a 10-year period can be charged with a felony on a third DUI arrest. Muer was released from the Blaine County jail Monday afternoon after posting three bonds totaling $70,000. Bail was set at $15,000 in the attempted strangulation case and at $5,000 in the latest DUI case. Judge Robert J. Elgee also raised bail in the January DUI and marijuana case from $25,000 to $50,000. Terms of Muer's release require that he abstain from alcohol or drug use, that he submit to random drug and alcohol testing, and that he wear an ankle monitoring device that electronically transmits information to authorities if he consumes alcohol. The device, referred to as a "SCRAM monitor," detects the presence of alcohol in a person's perspiration.